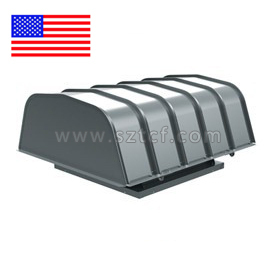 The LHDF Low Profile Filtered Hooded Propeller Roof Ventilator provides cost effective, general purpose ventilation of commercial buildings, with a pleasing low profile design that minimizes extension above the roof line. A wide array of adjustable pitch, cast aluminum propellers are available to meet specific performances and application requirements. Twin City Fan & Blower also offers a complete line of options and accessories such as roof curbs, backdraft dampers, disconnect switches and special coatings.